HOTELS in Derry enjoyed a bumper summer with average occupancy rates of up to 89% and a record 18,000 rooms sold in August alone, new figures show. Visit Derry reports today that summer 2016 saw the highest hotel occupancy levels ever seen in the city. July had an average occupancy of 84% while August peaked at 89% - record highs for both seasonal months. The previous record was August 2013 during City of Culture. The record-breaking figures coupled with neighbouring Donegal's Wild Atlantic Way exposure are combining to make the North West an increasingly must-see destination for visitors. Derry Mayor, Cllr Hilary McClintock said overnight visitors contributed almost £43m to the local tourism economy with hotel occupancy a key indicator of the region's attractiveness to tourists. “This is also good news for potential investors leading on future developments in the city following recent hotel planning approvals by Council," she said. 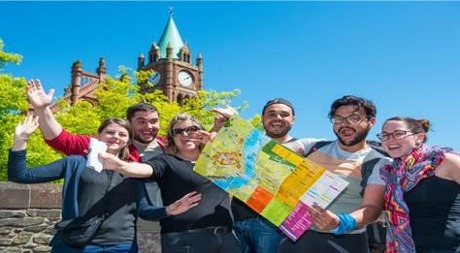 Overnight visitors generate almost £43m for Derry's tourism sector. Meanwhile, Da Vinci's Hotel general manager Andy O’Doherty said: “We had our busiest August on record at the hotel and September is looking very promising. Our increased occupancy is due to a number of reasons; more large scale events, a strong domestic market and a weak pound attracting more out-of-state visitors. We have seen the demand for rooms soar around Clipper and the Foyle Cup which highlights yet again the importance of a special events calendar for Derry." Visit Derry works in partnership with more than 260 tourism providers to raise the region's profile in national and international markets in collaboration with Tourism NI and Tourism Ireland.